Panther takes AE Masters on Gold Coast. 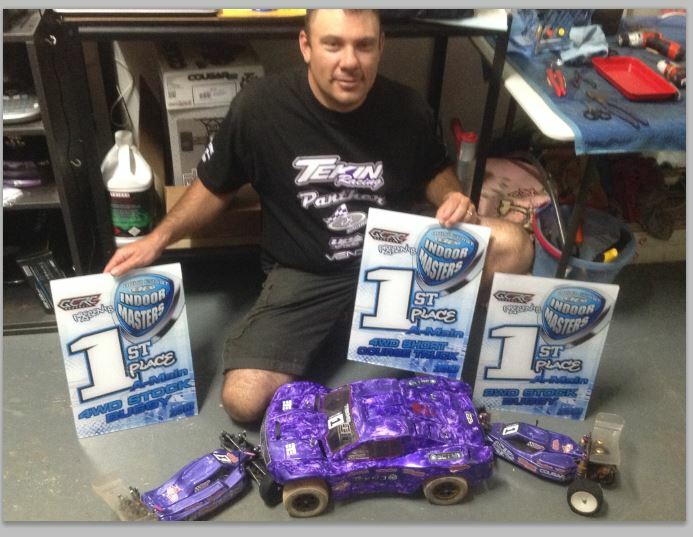 Panther Team driver Darren Lord takes 3 x TQ’s and 3 x wins with slicks and rattlers over the weekends comp. Saturday was buggy day and with a wet track early slicks were the tyre to be on but once the track dried out later in the day it was the rattlers that proved to give the winning edge for grip and consistency in both 2wd&4wd stock buggy. Back there Sunday for truck day and with 4wd SCT it was slicks all day long the track was moist and nice and traction rolling was on the cards with the amount of grip the panther slicks were producing. If you are racing on a damp indoor clay track be sure to have a set of Panther slicks in your tyre bag. This entry was posted on December 11, 2013. It was filed under Race News.